60 years of revolutionary fight of Tamils in Sri Lanka pushed towards a very cruel end by the strong support and involvement of India and world super powers. After 9/11 the mentality of the governments all around the world is to reduce and put an end to the revolutionary activities of minority people who seek their rights in different countries all around the world. India has Kashmir and Maoist issues, china has Tibet problem, US started their war against terrorism, and the list of countries which encounters the same kinds of problems of Sri Lanka joined hands to finish the Tamil Eelam dream. So much has been written and so much has been discussed in the past three years, after the brutal war of Sri Lanka killing more than 175000 Tamil people in the northern region of Sri Lanka, nothing has happened for the welfare of the people. Rajapakse, the president of Sri Lanka claimed that after finishing the chapter of LTTE (Liberation Tigers of Tamil Eelam) peace will prevail in the regions of Tamils. But the suffered Tamil people who lost their loved ones got only Hunger and poverty. And people around the world now realized that’s what exactly the Sri Lankan government wanted to give for Tamils. Yo.Thiruvalluvar, one of the writers on Geopolitical issues and ethnic fights, is also a person watching the Tamil revolution in Sri Lanka for so many years written this book in Tamil ( Eelam; Inapadukolaikku pinnaal) or Eealm-After genocide. 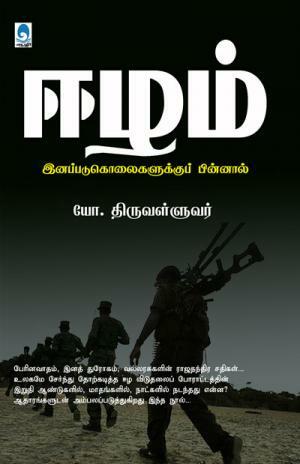 It is a great work in the historical literature of the Tamils that the book not only speaks about the justification of Tamil eelam, but the cruelties that Sinhalese showing on the minority Tamils. People say that if there was an acceptance of Peace treaty from LTTE side, then the bloodshed would have been stopped. But the Author clearly gives so many factual events and logical reasoning’s that Sinhalese and their supporter in India will never would have came for peace treaty. Their only aim is wipe out the LTTE and its leadership with the international and Indian helping hand. They to a greater extent did that. If you wanted to know about the past ten years of Sri Lankan politics, Sinhalese Tamil relationships, Views of the leadership of both the sides, it is a good one to read. Yo Thiruvalluvar has written another bestselling book called ‘Thirakadal odiyum thuyaram thedu’ is also a best seller, which speaks about the sufferings of workers who go abroad to work. After reading the book we will surely say aloud at least in our heart. The thrust of Tamils is Tamil Eelam motherland!